E. of Holderness, and E. of Halifax, take their Seats. Their Lordships having, at the Table, first taken the Oaths, and made and subscribed the Declaration, and also taken and subscribed the Oath of Abjuration, pursuant to the Statutes. Mistakes in Two former Acts, to rectify, Bill. Hodie 3a vice lecta est Billa, intituled, "An Act to rectify a Mistake in an Act made in the Sixth Year of the Reign of His late Majesty King Geroge, for preventing Frauds and Abuses in the Public Revenues of Excise, Customs, Stamp Duties, Post-office, and House-money, relating to the Condition of Bonds taken from Masters of Ships; and to indemnify Persons who have acted under the said Mistake; and also to obviate a Doubt which has arisen, upon an Act made in the Seventh Year of His said late Majesty's Reign, for the further preventing His Majesty's Subjects from trading to The East Indies under Foreign Commissions; and for encouraging and further securing the lawful Trade thereto, with regard to Prosecutions in Ireland in a summary Way, for the fraudulent Importation of East India Goods into that Kingdom." Hodie 3a vice lecta est Billa, intituled, "An Act for explaining and amending an Act made in the Eighth Year of the Reign of King Richard the Second, intituled, "No Man of Law shall be Justice of Assize or Gaol Delivery in his own Country;" and another Act made in the Thirty-third Year of the Reign of King Henry the Eighth, intituled, "An Act that none shall be Justice of Assize in his own Country, &c."
Message to H. C. that the Lords have agreed to them. Hodie 2a vice lecta est Billa, intituled, "An Act for enlarging the Term and Powers granted by an Act passed in the Twelfth Year of the Reign of His late Majesty King George the First, for repairing the Road from Spittlegate-Hill, near Grantham, in the County of Lincoln, to Little Drayton, in the County of Nottingham." Vis. Townshend. L. Bp. Durham. Hodie 2a vice lecta est Billa, intituled, "An Act for repairing the Road, or Highway, from The Dun Cow, in the Town of Dunchurch, through the Parish of Bilton, over Dunsmore Heath, to the Town of HillMorton, in the County of Warwick, and from thence through the several Parishes of Creek, West-Haddon, and East-Haddon, in the County of Northampton, to Saint James's End, in the Parish of Duston, in the said County of Northampton." It is Ordered and Adjudged, by the Lords Spiritual and Temporal in Parliament assembled, That the said Petition and Appeal be, and is hereby, dismissed this House; and that the said Interlocutor of the 14th of January 1736/7, and so much of the other Interlocutor as is in the said Appeal complained of, be, and the same are hereby, affirmed. Dominus Cancellarius declaravit præsens Parliamentum continuandum esse usque ad et in diem Martis, vicesimum secundum diem instantis Maii, hora undecima Auroræ, Dominis sic decernentibus. Viscount Falmouth. Ds. Harrington, Unus Primariorum Secretariorum. Messages from H. C. with Bills; and to return Sir W. Courtenay's Bill. To return the Bill, intituled, "An Act to establish and confirm an Agreement made between Sir William Courtenay Baronet and his Brother Henry Reginald Courtenay Esquire, and to render the same effectual to the several Uses and Purposes therein mentioned;" and to acquaint this House, that they have agreed to the same, without any Amendment. 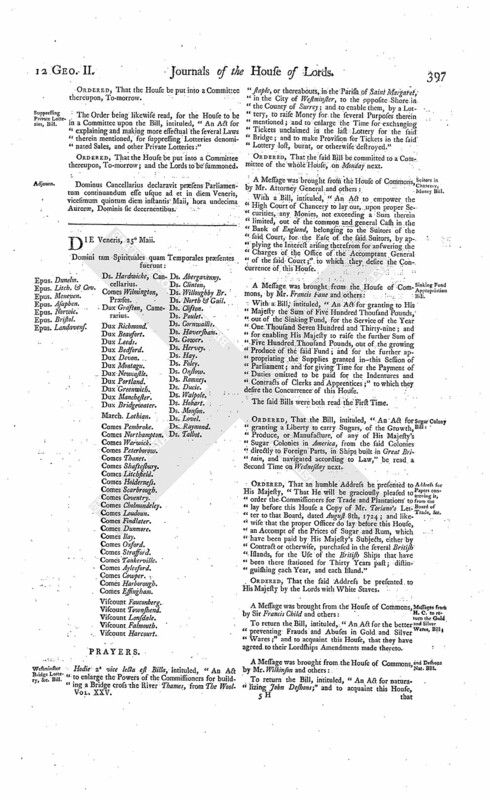 With a Bill, intituled, "An Act for the public Registering of all Deeds, Conveyances, Wills, and other Encumbrances, that shall be made of, or that may affect, any Honours, Manors, Lands, Tenements, or Hereditaments, within that Part of Great Britain called England, wherein Public Registers are not already appointed by Act of Parliament;" to which they desire the Concurrence of this House. Westminster Bridge Lottery, &c. Bill. 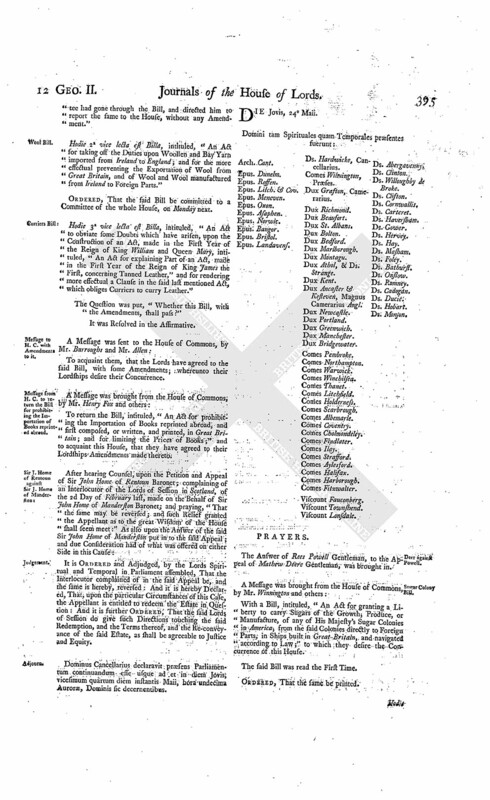 With a Bill, intituled, "An Act to enlarge the Powers of the Commissioners for building a Bridge cross the River Thames, from The Woolstaple or thereabouts, in the Parish of Saint Margaret, in the City of Westminster, to the opposite Shore in the County of Surrey; and to enable them, by a Lottery, to raise Money for the several Purposes therein mentioned; and to enlarge the Time for exchanging Tickets unclaimed in the last Lottery for the said Bridge; and to make Provision for Tickets in the said Lottery lost, burnt, or otherwise destroyed;" to which they desire the Concurrence of this House. The said Bills were read the First Time; and both severally ordered to be printed. Houghton for Evidence to be produced at hearing Sir Geo. Caswell's Appeal. Upon reading the Petition of Thomas Houghton Esquire, Respondent to the Appeal of Sir George Caswall Knight and others; setting forth, "That the following Evidence, belonging to and in the Custody of the Appellants, videlicet, their Security Book (No 4), their General Cash Book (A), their Drawing Rough Ledger (I), and their Security Book (R K);" and further setting forth, "That the following Evidence, belonging to and in the Custody of the South Sea Company, videlicet, Two South Sea First Subscription Receipts (No 1145 and 295), an Accompt, intituled, "The Honourable South Sea Company Debtor per Cont. with Mr. Turner and Company Creditor," Three Journal Books, marked respectively (A), (B), and (C), relating to the Third Payment on Subscription Receipts in 1720, the Books of Loans and Subscriptions relating to the Loan of £. 150,600 to the Appellants, the Ledger marked (C) relating to Loans on Subscriptions in the Year 1720, and the Book (A. N) relating to the same, were, by several Orders of the Court of Exchequer, produced and made use of at the Hearing and Re-hearing of the Cause there;" and praying, "In regard the Petitioner is advised that the said Evidence will be necessary for him on the hearing the said Appeal, that the proper Officer or Officers of the said Company may attend, with the Evidences in their Custody; and that the Appellants may produce the said Evidence in their Custody, on the Hearing in this House;"
It is Ordered, That the proper Officer or Officers of the said Company do (at the Petitioner's Expence) attend this House, with the said Evidences, at the said Hearing; and that the Appellants do produce, at the same Time, the Evidences in their Custody abovementioned. The Earl of Warwick (according to Order) reported from the Committee of the whole House, to whom the Bill, intituled, "An Act to obviate some Doubts which have arisen, upon the Construction of an Act made in the First Year of the Reign of King William and Queen Mary, intituled, "An Act for explaining Part of an Act made in the First Year of the Reign of King James the First, concerning Tanned Leather;" and for rendering more effectual a Clause in the said last mentioned Act, as obliges Curriers to curry Leather," was committed, the Amendments made by the Committee to the said Bill. "Press 3, Line 21. Leave out from ["Discretion"], to ["And be it further Enacted"] in the 28th Line; and insert Clauses (A), (B), and (C). "(A). And be it further Enacted, by the Authority aforesaid, That if any Person or Persons shall think himself or themselves aggrieved by the Determination of the Justice or Justices aforesaid, it shall and may be lawful for such Person or Persons to appeal to the General Quarter Sessions of the Peace, to be next held for such County, City, Town Corporate, Liberty, or Place, where such Offence shall be committed; and that the Determination of the Justices, or the major Part of them, then and there made, shall be conclusive and final to all Intents and Purposes whatsoever; and that no Certiorari shall be allowed, to remove any Determinations or Proceedings as above directed. "(B). And be it further Enacted, by the Authority aforesaid, That the Two Clauses in an Act made in the First Year of King James the First, intituled, "An Act concerning Tanners, Curriers, Shoemakers, and other Artificers occupying the cutting of Leather," which prohibit any Persons dwelling in London, the Liberties thereof, or within Three Miles of the said City, occupying wet curried Leather in their Art or Occupation, to put forth such Leather to be curried, but to such Persons as are free of the Company of Curriers of the City of London, under Pain of Forfeiture of such Leather, or the Value thereof; and also prohibiting any Persons within the said City, or Three Miles Distance, to put in any made Wares any curried Leather, before the same shall be searched and allowed by the Wardens of the Curriers of London, and be sealed with their Seal, upon Pain of forfeiting for every Hide or Skin otherwise curried or employed Six Shillings and Eight Pence, and the Value of such Hide or Skin; shall, from and after the said Twentyfourth Day of June, be, and are by this present Act, repealed and made void to all Intents and Purposes whatsoever; any Thing in the said recited Act, or any other Act, contained to the contrary thereof, in any Wise notwithstanding. "(C). Provided nevertheless, That nothing herein contained shall extend, or be construed to extend, to lessen or take away any Power or Privilege given to the said Company of Curriers by Charter, or Grant, so far as they may or can use or exercise the same, in the City of London, or Liberties thereof." "To the Title of the Bill add, ["And for repealing Two Clauses in the said last mentioned Act"]." Reward to Mrs. Stephens for her Medicines, Bill. Hodie 2a vice lecta est Billa, intituled, "An Act for providing a Reward to Joanna Stephens, upon a proper Discovery to be made by her, for the Use of the Public, of the Medicines prepared by her for the Cure of the Stone." To amend Insolvent Debtors Act, Bill. The House (according to Order) was adjourned during Pleasure, and put into a Committee upon the Bill, intituled, "An Act for explaining and amending an Act passed in the Tenth Year of His present Majesty's Reign, intituled, "An Act for Relief of Insolvent Debtors;" and so much of an Act, passed in the last Session of Parliament, as extends the Benefit of the said Act for Relief of Insolvent Debtors, to Creditors whose Debtors were committed to Prison since the First Day of January One Thousand Seven Hundred and Thirty-six, and have chose to continue there." And the Earl of Warwick reported from the said Committee, "That they had heard Counsel, as well for as against the said Bill." Ordered, That the House be put into a Committee again upon the said Bill, on this Day Two Months. Private Lotteries, &c. suppressings Bill. Hodie 2a vice lecta est Billa, intituled, "An Act for explaining and making more effectual the several Laws therein mentioned, for suppressing Lotteries denominated Sales, and other Private Lotteries." Dominus Cancellarius declaravit præsens Parliamentum continuandum esse usque ad et in diem Mercurii, vicesimum tertium diem instantis Maii, hora undecima Auroræ, Dominis sic decernentibus. The Duke of Portland reported from the Lords Committees to whom the Bill, intituled, "An Act for enlarging the Term and Powers granted by an Act, passed in the Twelfth Year of the Reign of His late Majesty King George the First, for repairing the Road from Spittlegate Hill, near Grantham, in the County of Lincoln, to Little Drayton, in the County of Nottingham," was committed: "That they had considered the said Bill, and examined the Allegations thereof, which they found to be true; and that the Commit tee had gone through the Bill, and directed him to report the same to the House, without any Amendment." Hodie 2a vice lecta est Billa, intituled, "An Act for taking off the Duties upon Woollen and Bay Yarn imported from Ireland to England; and for the more effectual preventing the Exportation of Wool from Great Britain, and of Wool and Wool manufactured from Ireland to Foreign Parts." Hodie 3a vice lecta est Billa, intituled, "An Act to obviate some Doubts which have arisen, upon the Construction of an Act, made in the First Year of the Reign of King William and Queen Mary, intituled, "An Act for explaining Part of an Act, made in the First Year of the Reign of King James the First, concerning Tanned Leather," and for rendering more effectual a Clause in the said last mentioned Act, which obliges Curriers to curry Leather." To acquaint them, that the Lords have agreed to the said Bill, with some Amendments; whereunto their Lordships desire their Concurrence. Message from H. C. to return the Bill for prohibiting the Importation of Books reprinted abroad. 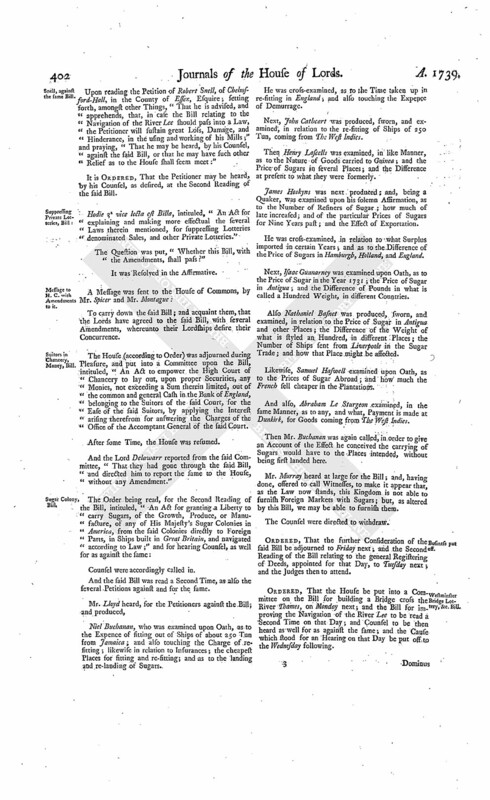 To return the Bill, intituled, "An Act for prohibiting the Importation of Books reprinted abroad, and first composed, or written, and printed, in Great Britain; and for limiting the Prices of Books;" and to acquaint this House, that they have agreed to their Lordships Amendments made thereto. It is Ordered and Adjudged, by the Lords Spiritual and Temporal in Parliament assembled, That the Interlocutor complained of in the said Appeal be, and the same is hereby, reversed: And it is hereby Declared, That, upon the particular Circumstances of this Case, the Appellant is entitled to redeem the Estate in Question: And it is further Ordered, That the said Lords of Session do give such Directions touching the said Redemption, and the Terms thereof, and the Re-conveyance of the said Estate, as shall be agreeable to Justice and Equity. Dominus Cancellarius declaravit præsens Parliamentum continuandum esse usque ad et in diem Jovis, vicesimum quartum diem instantis Maii, hora undecima Auroræ, Dominis sic decernentibus. The Answer of Rees Powell Gentleman, to the Appeal of Mathew Deere Gentleman, was brought in. With a Bill, intituled, "An Act for granting a Liberty to carry Sugars of the Growth, Produce, or Manufacture, of any of His Majesty's Sugar Colonies in America, from the said Colonies directly to Foreign Parts, in Ships built in Great Britain, and navigated according to Law;" to which they desire the Concurrence of this House. Hodie 3a vice lecta est Billa, intituled, "An Act for enlarging the Term and Powers granted by an Act, passed in the Twelfth Year of the Reign of His late Majesty King George the First, for repairing the Road from Spittlegate Hill, near Grantham, in the County of Lincoln, to Little Drayton, in the County of Nottingham." Message from thence, to return the D. of Norfolk's Bill. To return the Bill, intituled, "An Act to enable Edward Duke of Norfolk to grant Building Leases for Ninety-nine Years of all or any Part of his Lands, in or near the Township of Sheffield, in the County of York;" and to acquaint this House, that they have agreed to the same, without any Amendment. To return the Bill, intituled, "An Act for vesting divers Lands and Hereditaments in the County of Somerset, being Part of the settled Estate of Thomas Fownes Esquire, in Trust, to be sold; and for settling other Lands in the County of Devon, of a greater Value, to the same Uses, in Lieu thereof;" and to acquaint this House, that they have agreed to the same, without any Amendment. and Sir John Lear's Bill. To return the Bill, intituled, "An Act for Sale of Part of the Estate late of Sir John Lear Baronet, deceased, in the County of Devon, for Payment of his Debts, and for other Purposes therein mentioned;" and to acquaint this House, that they have agreed to the said Bill, with some Amendments; whereunto they desire their Lordships Concurrence. With a Bill, intituled, "An Act for the more easy and effectual Recovery of Small Debts;" to which they desire the Concurrence of this House. Ordered, That the Cause wherein Gerald Burke Esquire is Appellant, and Sir Walter Blake Baronet, Respondent, appointed for To-morrow, be put off to Wednesday next; and no other Cause to be heard this Session. Lady Dinely, Pet. for more Money, referred to Committee. Upon reading the Petition of Dame Mary Dinely, Wife of Sir John Dinely Baronet; praying, "That the One Hundred Pounds already lodged with the Clerk Assistant may be ordered to be paid the Petitioner's Solicitor; and that the said Sir John may be required to advance such further Sum of Money as shall be thought proper, to enable the Petitioner to satisfy her Witnesses for their Time and Expences, and to pay her Solicitor for his Trouble and Fees in assisting her to make her Defence to the Bill lately depending in this House, for dissolving the Marriage of the said Sir John Dinely with the Petitioner:"
Vis. Fauconberg. L. Abp. Cant. L. B. Landaff. L. Clifton. The House (according to Order) was adjourned during Pleasure, and put into a Committee upon the Bill, intituled, "An Act for the more effectual suppressing of Rogues, Vagabonds, and other idle and disorderly Persons." And the Earl of Warwick reported from the said Committee, "That they had met upon the said Bill, and made a Progress therein." Ordered, That the House be again put into a Committee, thereupon, on this Day Month. 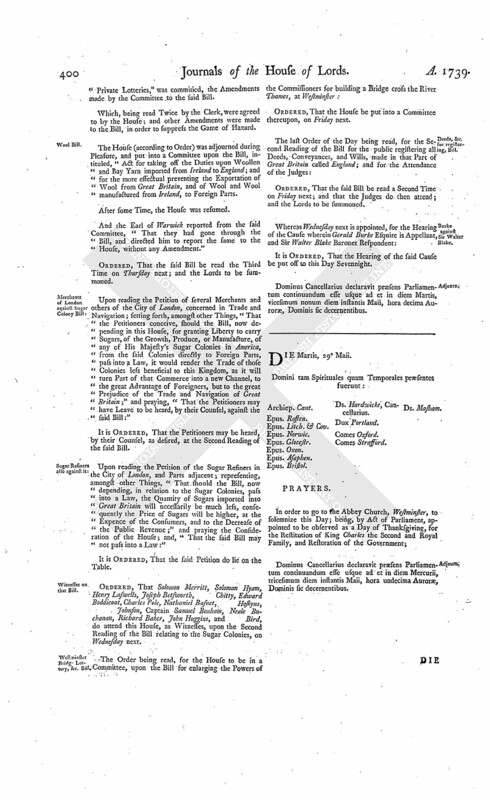 Ordered, That the Judges do prepare a Bill, for amending and enforcing the Laws relating to Rogues, Vagabonds, and other idle and disorderly Persons, and for reducing the same into One Act of Parliament; and also for amending the Laws relating to the erecting of Houses of Correction; and present the same to this House the next Session of Parliament. His Majesty's Consent to the Westminster Bridge Bill. The Duke of Newcastle acquainted the House, "That His Majesty, having been apprized of the Contents of the Bill to enlarge the Powers of the Commissioners for building a Bridge cross the River Thames at Westminster, was pleased (so far as the Interest of the Crown was concerned) to consent that the House might do as they think fit." Mrs. Stephens, a Reward for her Medicine, Bill. 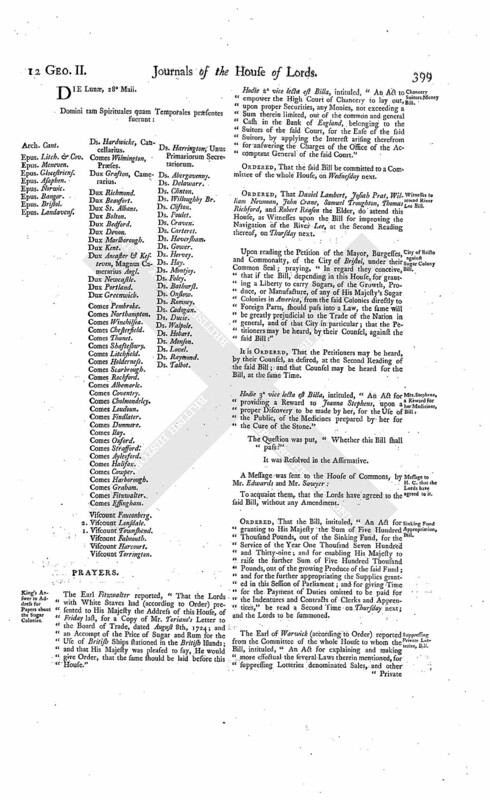 The Order being read, for the House to be put into a Committee upon the Bill, intituled, "An Act for providing a Reward to Joanna Stephens, upon a proper Discovery to be made by her, for the Use of the Public, of the Medicines prepared by her for the Cure of the Stone:"
Ordered, That the House be put into a Committee thereupon, To-morrow. 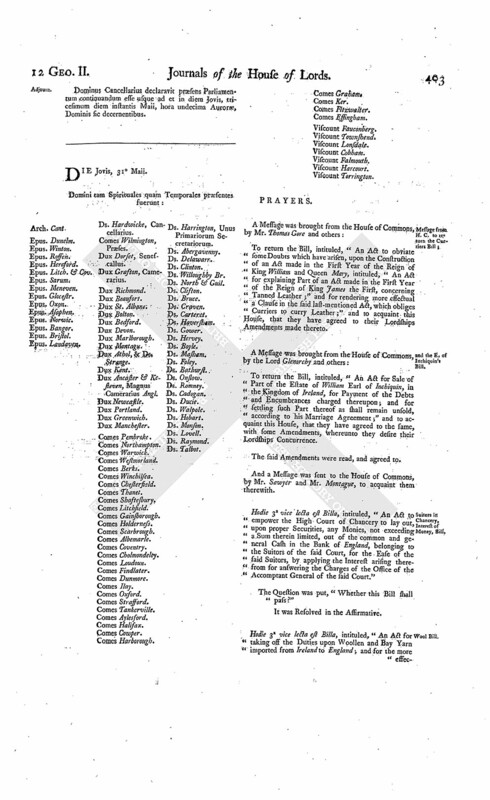 The Order being likewise read, for the House to be in a Committee upon the Bill, intituled, "An Act for explaining and making more effectual the several Laws therein mentioned, for suppressing Lotteries denominated Sales, and other Private Lotteries:"
Ordered, That the House be put into a Committee thereupon, To-morrow; and the Lords to be summoned. Dominus Cancellarius declaravit præsens Parliamentum continuandum esse usque ad et in diem Veneris, vicesimum quintum diem instantis Maii, hora undecima Auroræ, Dominis sic decernentibus. Hodie 2a vice lecta est Billa, intituled, "An Act to enlarge the Powers of the Commissioners for building a Bridge cross the River Thames, from The Woolstaple, or thereabouts, in the Parish of Saint Margaret, in the City of Westminster, to the opposite Shore in the County of Surrey; and to enable them, by a Lottery, to raise Money for the several Purposes therein mentioned; and to enlarge the Time for exchanging Tickets unclaimed in the last Lottery for the said Bridge; and to make Provision for Tickets in the said Lottery lost, burnt, or otherwise destroyed." Suitors in Chancery, Money Bill. 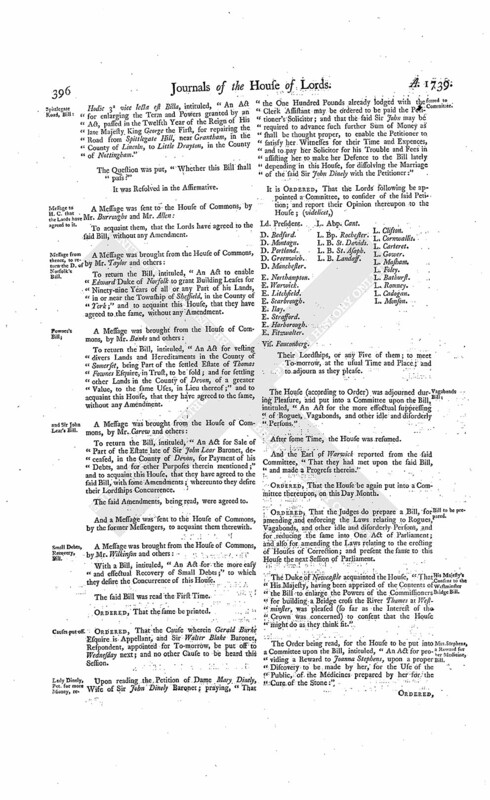 With a Bill, intituled, "An Act to empower the High Court of Chancery to lay out, upon proper Securities, any Monies, not exceeding a Sum therein limited, out of the common and general Cash in the Bank of England, belonging to the Suitors of the said Court, for the Ease of the said Suitors, by applying the Interest arising therefrom for answering the Charges of the Office of the Accomptant General of the said Court;" to which they desire the Concurrence of this House. With a Bill, intituled, "An Act for granting to His Majesty the Sum of Five Hundred Thousand Pounds, out of the Sinking Fund, for the Service of the Year One Thousand Seven Hundred and Thirty-nine; and for enabling His Majesty to raise the further Sum of Five Hundred Thousand Pounds, out of the growing Produce of the said Fund; and for the further appropriating the Supplies granted in this Session of Parliament; and for giving Time for the Payment of Duties omitted to be paid for the Indentures and Contracts of Clerks and Apprentices;" to which they desire the Concurrence of this House. Ordered, That the Bill, intituled, "An Act for granting a Liberty to carry Sugars, of the Growth, Produce, or Manufacture, of any of His Majesty's Sugar Colonies in America, from the said Colonies directly to Foreign Parts, in Ships built in Great Britain, and navigated according to Law," be read a Second Time on Wednesday next. Address for Papers concerning it, from the Board of Trade, &c.
Ordered, That an humble Address be presented to His Majesty, "That He will be graciously pleased to order the Commissioners for Trade and Plantations to lay before this House a Copy of Mr. Toriano's Letter to that Board, dated August 8th, 1724; and likewise that the proper Officer do lay before this House, an Accompt of the Prices of Sugar and Rum, which have been paid by His Majesty's Subjects, either by Contract or otherwise, purchased in the several British Islands, for the Use of the British Ships that have been there stationed for Thirty Years past; distinguishing each Year, and each Island." To return the Bill, intituled, "An Act for the better preventing Frauds and Abuses in Gold and Silver Wares;" and to acquaint this House, that they have agreed to their Lordships Amendments made thereto. To return the Bill, intituled, "An Act for naturalizing John Deshons;" and to acquaint this House, that they have agreed to the said Bill, without any Amendment. The Earl of Warwick reported from the Lords Committees to whom the Bill, intituled, "An Act for repairing the Road, or Highway, from The Dun Cow, in the Town of Dunchurch, through the Parish of Bilton, over Dunsmore Heath, to the Town of HillMorton, in the County of Warwick; and from thence, through the several Parishes of Creek, West-Haddon, and East-Haddon, in the County of Northampton, to Saint James's End, in the Parish of Duston, in the said County of Northampton," was committed: "That they had considered the said Bill, and examined the Allegations thereof, which they found to be true; and that the Committee had gone through the Bill, and directed him to report the same to the House, without any Amendment." Hodie 3a vice lecta est Billa, intituled, "An Act for enlarging the Term and Powers granted by Two Acts of Parliament, One made in the Sixth Year of the Reign of Her late Majesty Queen Anne, and the other in the Seventh Year of the Reign of His late Majesty King George the First, for repairing and enlarging the Highways between the Top of Kingsdown Hill and the City of Bath, and for amending several other Highways leading to the said City; and for cleansing, paving, and enlightening the Streets, and regulating the Chairmen there; and for keeping a regular Nightly Watch within the said City and Liberties thereof." Mrs. Stephens, a Reward for her Medicines, Bill. The House (according to Order) was adjourned during Pleasure, and put into a Committee upon the Bill, intituled, "An Act for providing a Reward to Joanna Stephens, upon a proper Discovery to be made by her, for the Use of the Public, of the Medicines prepared by her for the Cure of the Stone." And the Earl of Warwick reported from the said Committee, "That they had gone through the Bill, and directed him to report the same to the House, without any Amendment"
The House also (according to Order) was adjourned during Pleasure, and put into a Committee upon the Bill, intituled, "An Act for explaining and making more effectual the several Laws therein mentioned, for suppressing Lotteries denominated Sales, and other Private Lotteries." And the Earl of Warwick reported from the said Committee, "That they had gone through the Bill, and made some Amendments thereunto; which he would be ready to report, when the House will please to receive the same." Ordered, That the said Report be received on Monday next. With a Bill, intituled, "An Act for ascertaining, preserving, and improving, the Navigation of the River Lee, from the Town of Hertford, to the Town of Ware, in the County of Hertford; and for preserving and improving the said River, from the said Town of Ware, to the new Cut, or River, made by the Mayor, Commonalty, and Citizens of London; and for enabling the Governor and Company of The New River the better to supply the Cities of London and Westminster, and the Liberties and Suburbs thereof, with good and wholesome Water;" to which they desire the Concurrence of this House. Ordered, That the said Bill be read a Second Time on Thursday next. 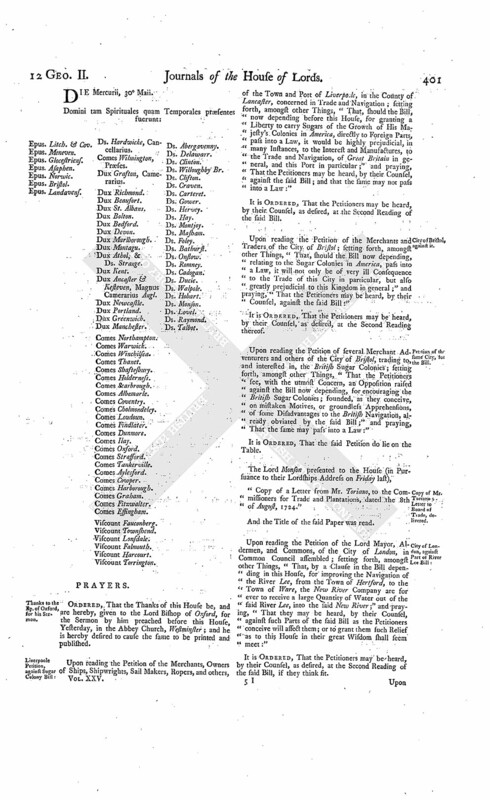 A Petition of Henry Hare Baron of Colraine in the Kingdom of Ireland, and John Walton, of Waltham Abby, in the County of Essex, Gentleman, was presented, and read; praying, "In regard they apprehend, and are advised, in case the Bill for improving the Navigation of the River Lee should pass into a Law, they will sustain great Damage in working of their Mills on a Branch of the said River, and be otherwise affected in their Property; that they may be heard, by their Counsel, against the said Bill; or that they may have such Relief as to the House shall seem meet:"
Ordered, That the Petitioners may be heard, by their Counsel, as desired, at the Second Reading of the said Bill; as may also Counsel be heard for the Bill at the same Time. And the like Order was made, as to the Hearing of Counsel; with this Addition, "That only Two Counsel shall be heard on all the said Petitions; and Two only for the Bill." and Lloyd also to be heard against it. Then, a Petition of John Lloyd, of Ryton, in the Bishopric of Durham, Clerk, was presented, and read; praying, "In regard he apprehends, and is advised, in case the Bill for improving the Navigation of the River Lee should pass into a Law, he will be greatly prejudiced, and a Suit by him lately commenced in the Court of Chancery, against the Governor and Company of The New River, be thereby greatly affected, and the Petitioner deprived of the Benefit he would by the Laws of the Land be entitled unto; that he may be heard, by his Counsel, against the said Bill; or that he may have such Relief as to the House shall seem meet:"
Ordered, That the Petitioner may be heard, by One Counsel, as desired, at the Second Reading of the said Bill. 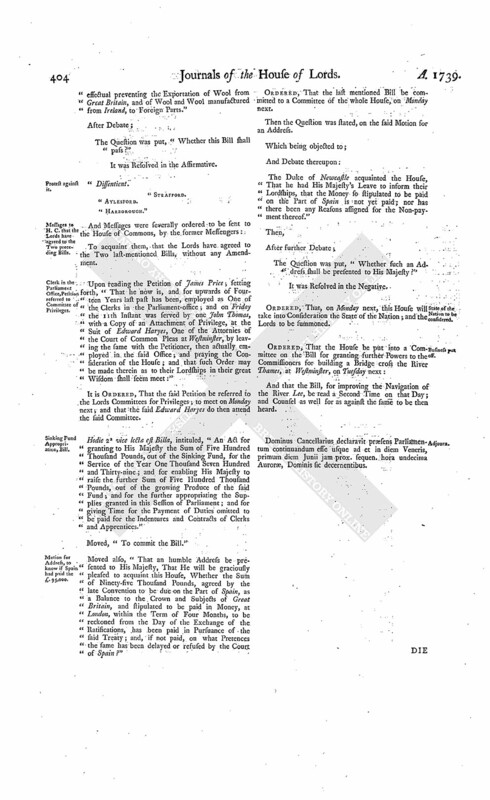 Ordered, That the Bill, intituled, "An Act for the Public Registering of all Deeds, Conveyances, Wills, and other Encumbrances, that shall be made of, or that may affect, any Honors, Manors, Lands, Tenements, or Hereditaments, within that Part of Great Britain called England, wherein Public Registers are not already appointed by Act of Parliament," be read a Second Time on Monday next; and the Lords to be summoned; and the Judges to attend. Dominus Cancellarius declaravit præsens Parliamentum continuandum esse usque ad et in diem Lunæ, vicesimum octavum diem instantis Maii, hora undecima Auroræ, Dominis sic decernentibus. King's Answer to Address for Papers about the Sugar Colonies. The Earl Fitzwalter reported, "That the Lords with White Staves had (according to Order) presented to His Majesty the Address of this House, of Friday last, for a Copy of Mr. Toriano's Letter to the Board of Trade, dated August 8th, 1724; and an Accompt of the Price of Sugar and Rum for the Use of British Ships stationed in the British Islands; and that His Majesty was pleased to say, He would give Order, that the same should be laid before this House." Hodie 2a vice lecta est Billa, intituled, "An Act to empower the High Court of Chancery to lay out, upon proper Securities, any Monies, not exceeding a Sum therein limited, out of the common and general Cash in the Bank of England, belonging to the Suitors of the said Court, for the Ease of the said Suitors, by applying the Interest arising therefrom for answering the Charges of the Office of the Accomptant General of the said Court." Witnesses to attend River Lee Bill. Ordered, That Daniel Lambert, Josiah Prat, William Newman, John Crane, Samuel Troughton, Thomas Richford, and Robert Reason the Elder, do attend this House, as Witnesses upon the Bill for improving the Navigation of the River Lee, at the Second Reading thereof, on Thursday next. City of Bristo against Sugar Colony Bill. 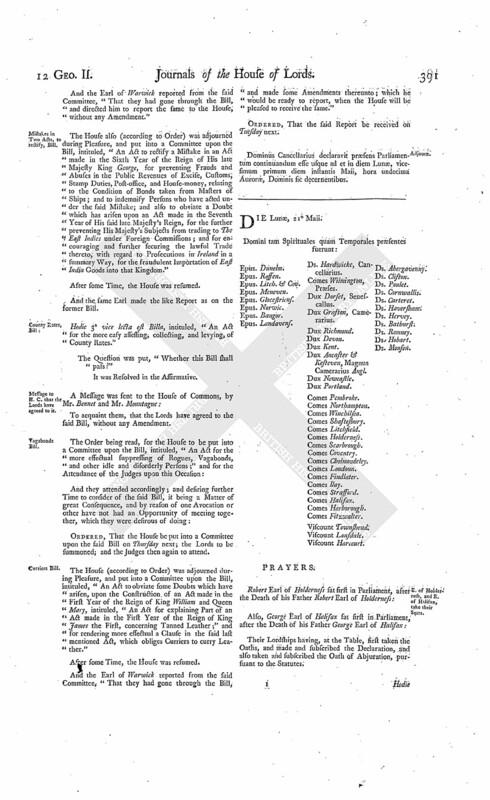 Upon reading the Petition of the Mayor, Burgesses, and Commonalty, of the City of Bristol, under their Common Seal; praying, "In regard they conceive, that if the Bill, depending in this House, for granting a Liberty to carry Sugars, of the Growth, Produce, or Manufacture, of any of His Majesty's Sugar Colonies in America, from the said Colonies directly to Foreign Parts, should pass into a Law, the same will be greatly prejudicial to the Trade of the Nation in general, and of that City in particular; that the Petitioners may be heard, by their Counsel, against the said Bill:"
It is Ordered, That the Petitioners may be heard, by their Counsel, as desired, at the Second Reading of the said Bill; and that Counsel may be heard for the Bill, at the same Time. Hodie 3a vice lecta est Billa, intituled, "An Act for providing a Reward to Joanna Stephens, upon a proper Discovery to be made by her, for the Use of the Public, of the Medicines prepared by her for the Cure of the Stone." 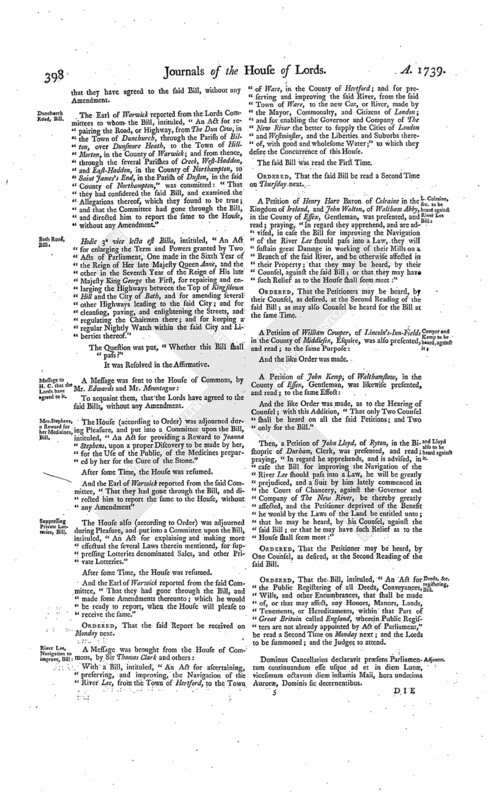 Ordered, That the Bill, intituled, "An Act for granting to His Majesty the Sum of Five Hundred Thousand Pounds, out of the Sinking Fund, for the Service of the Year One Thousand Seven Hundred and Thirty-nine; and for enabling His Majesty to raise the further Sum of Five Hundred Thousand Pounds, out of the growing Produce of the said Fund; and for the further appropriating the Supplies granted in this Session of Parliament; and for giving Time for the Payment of Duties omitted to be paid for the Indentures and Contracts of Clerks and Apprentices," be read a Second Time on Thursday next; and the Lords to be summoned. The Earl of Warwick (according to Order) reported from the Committee of the whole House to whom the Bill, intituled, "An Act for explaining and making more effectual the several Laws therein mentioned, for suppressing Lotteries denominated Sales, and other Private Lotteries," was commitied, the Amendments made by the Committee to the said Bill. Which, being read Twice by the Clerk, were agreed to by the House; and other Amendments were made to the Bill, in order to suppress the Game of Hazard. The House (according to Order) was adjourned during Pleasure, and put into a Committee upon the Bill, intituled, "Act for taking off the Duties upon Woollen and Bay Yarn imported from Ireland to England; and for the more effectual preventing the Exportation of Wool from Great Britain, and of Wool and Wool manufactured from Ireland, to Foreign Parts. Upon reading the Petition of several Merchants and others of the City of London, concerned in Trade and Navigation; setting forth, amongst other Things, "That the Petitioners conceive, should the Bill, now depending in this House, for granting Liberty to carry Sugars, of the Growth, Produce, or Manufacture, of any of His Majesty's Sugar Colonies in America, from the said Colonies directly to Foreign Parts, pass into a Law, it would render the Trade of those Colonies less beneficial to this Kingdom, as it will turn Part of that Commerce into a new Channel, to the great Advantage of Foreigners, but to the great Prejudice of the Trade and Navigation of Great Britain;" and praying, "That the Petitioners may have Leave to be heard, by their Counsel, against the said Bill:"
It is Ordered, That the Petitioners may be heard, by their Counsel, as desired, at the Second Reading of the said Bill. Upon reading the Petition of the Sugar Refiners in the City of London, and Parts adjacent; representing, amongst other Things, "That should the Bill, now depending, in relation to the Sugar Colonies, pass into a Law, the Quantity of Sugars imported into Great Britain will necessarily be much less, consequently the Price of Sugars will be higher, at the Expence of the Consumers, and to the Decrease of the Public Revenue;" and praying the Consideration of the House; and, "That the said Bill may not pass into a Law:"
Ordered, That Solomon Merritt, Soloman Hyam, Henry Laswells, Joseph Betsworth, Chitty, Edward Boddicoat, Charles Pole, Nathaniel Basnet, Hoskyns, Johnson, Captain Samuel Bonham, Neale Buchanan, Richard Baker, John Huggins, and Bird, do attend this House, as Witnesses, upon the Second Reading of the Bill relating to the Sugar Colonies, on Wednesday next. Ordered, That the House be put into a Committee thereupon, on Friday next. Deeds, &c. for registering, Bill. Ordered, That the said Bill be read a Second Time on Friday next; and that the Judges do then attend; and the Lords to be summoned. Burke against Sir Walter Blake. It is Ordered, That the Hearing of the said Cause be put off to this Day Sevennight. Dominus Cancellarius declaravit præsens Parliamentum continuandum esse usque ad et in diem Martis, vicesimum nonum diem instantis Maii, hora decima Auroræ, Dominis sic decernentibus. Dominus Cancellarius declaravit præsens Parliamentum continuandum esse usque ad et in diem Mercurii, tricesimum diem instantis Maii, hora undecima Auroræ, Dominis sic decernentibus. Thanks to the Bp. of Oxford, for his Sermon. Ordered, That the Thanks of this House be, and are hereby, given to the Lord Bishop of Oxford, for the Sermon by him preached before this House, Yesterday, in the Abbey Church, Westminster; and he is hereby desired to cause the same to be printed and published. Upon reading the Petition of the Merchants, Owners of Ships, Shipwrights, Sail Makers, Ropers, and others, of the Town and Port of Liverpoole, in the County of Lancaster, concerned in Trade and Navigation; setting forth, amongst other Things, "That, should the Bill, now depending before this House, for granting a Liberty to carry Sugars of the Growth of His Majesty's Colonies in America, directly to Foreign Parts, pass into a Law, it would be highly prejudicial, in many Instances, to the Interest and Manufactures, to the Trade and Navigation, of Great Britain in general, and this Port in particular;" and praying, That the Petitioners may be heard, by their Counsel, against the said Bill; and that the same may not pass into a Law:"
City of Bristol, against it. Upon reading the Petition of the Merchants and Traders of the City of Bristol; setting forth, amongst other Things, "That, should the Bill now depending, relating to the Sugar Colonies in America, pass into a Law, it will not only be of very ill Consequence to the Trade of this City in particular, but also greatly prejudicial to this Kingdom in general;" and praying, "That the Petitioners may be heard, by their Counsel, against the said Bill:"
It is Ordered, That the Petitioners may be heard, by their Counsel, as desired, at the Second Reading thereof. 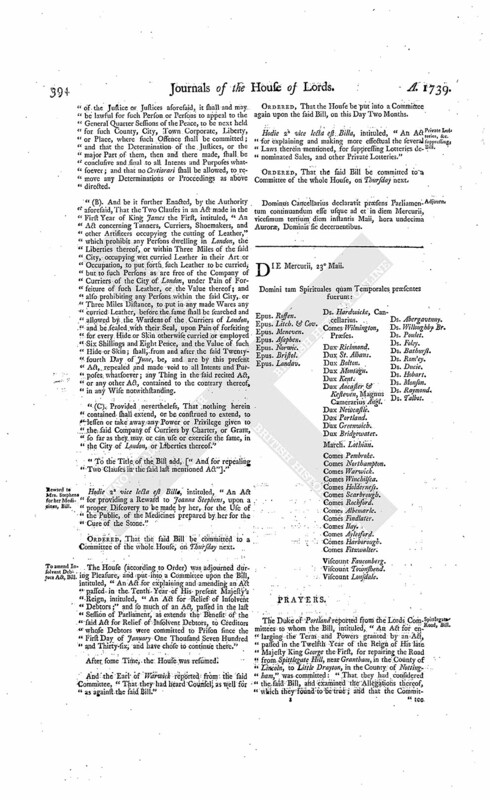 Petition of the same City, for the Bill. Upon reading the Petition of several Merchant Adventurers and others of the City of Bristol, trading to, and interested in, the British Sugar Colonies; setting forth, amongst other Things, "That the Petitioners see, with the utmost Concern, an Opposition raised against the Bill now depending, for encouraging the British Sugar Colonies; founded, as they conceive, on mistaken Motives, or groundless Apprehensions, of some Disadvantages to the British Navigation, already obviated by the said Bill;" and praying, That the same may pass into a Law:"
Copy of Mr. Torianos Letter to Board of Trade, delivered. "Copy of a Letter from Mr. Toriano, to the Commissioners for Trade and Plantations, dated the 8th of August, 1724." And the Title of the said Paper was read. 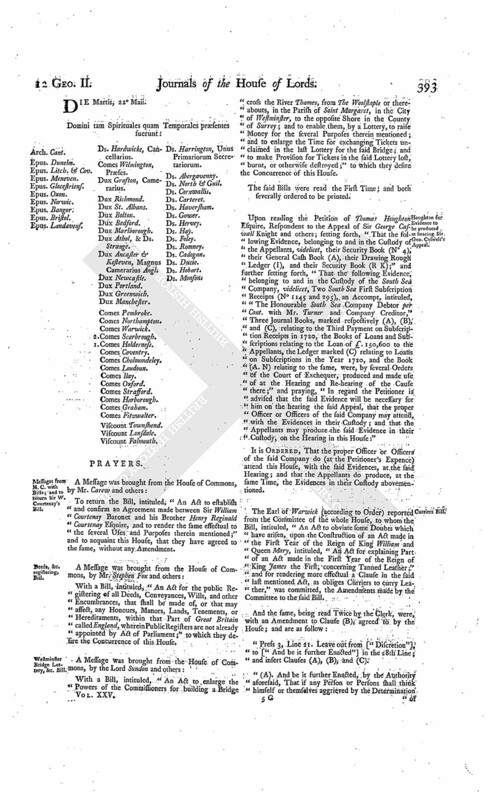 Upon reading the Petition of the Lord Mayor, Aldermen, and Commons, of the City of London, in Common Council assembled; setting forth, amongst other Things, "That, by a Clause in the Bill depending in this House, for improving the Navigation of the River Lee, from the Town of Hertford, to the Town of Ware, the New River Company are for ever to receive a large Quantity of Water out of the said River Lee, into the said New River;" and praying, "That they may be heard, by their Counsel, against such Parts of the said Bill as the Petitioners conceive will affect them; or to grant them such Relief as to this House in their great Wisdom shall seem meet:"
It is Ordered, That the Petitioners may be heard, by their Counsel, as desired, at the Second Reading of the said Bill, if they think fit. Snell, against the same Bill. Upon reading the Petition of Robert Snell, of Chelmsford-Hall, in the County of Essex, Esquire; setting forth, amongst other Things, "That he is advised, and apprehends, that, in case the Bill relating to the Navigation of the River Lee should pass into a Law, the Petitioner will sustain great Loss, Damage, and Hinderance, in the using and working of his Mills;" and praying, "That he may be heard, by his Counsel, against the said Bill, or that he may have such other Relief as to the House shall seem meet:"
It is Ordered, That the Petitioner may be heard, by his Counsel, as desired, at the Second Reading of the said Bill. Hodie 3a vice lecta est Billa, intituled, "An Act for explaining and making more effectual the several Laws therein mentioned, for suppressing Lotteries denominated Sales, and other Private Lotteries." To carry down the said Bill; and acquaint them, that the Lords have agreed to the said Bill, with several Amendments, whereunto their Lordships desire their Concurrence. Suitors in Chancery, Money, Bill. The House (according to Order) was adjourned during Pleasure, and put into a Committee upon the Bill, intituled, "An Act to empower the High Court of Chancery to lay out, upon proper Securities, any Monies, not exceeding a Sum therein limited, out of the common and general Cash in the Bank of England, belonging to the Suitors of the said Court, for the Ease of the said Suitors, by applying the Interest arising therefrom for answering the Charges of the Office of the Accomptant General of the said Court. And the Lord Delawarr reported from the said Committee, "That they had gone through the said Bill, and directed him to report the same to the House, without any Amendment." And the said Bill was read a Second Time, as also the several Petitions against and for the same. Niel Buchanan, who was examined upon Oath, as to the Expence of fitting out of Ships of about 250 Tun from Jamaica; and also touching the Charge of refitting; likewise in relation to Insurances; the cheapest Places for fitting and re-fitting; and as to the landing and re-landing of Sugars. He was cross-examined, as to the Time taken up in re-fitting in England; and also touching the Expence of Demurrage. Next, John Cathcart was produced, sworn, and examined, in relation to the re-fitting of Ships of 250 Tun, coming from The West Indies. Then Henry Lascells was examined, in like Manner, as to the Nature of Goods carried to Guinea; and the Price of Sugars in several Places; and the Difference at present to what they were formerly. James Hoskyns was next produced; and, being a Quaker, was examined upon his solemn Affirmation, as to the Number of Resiners of Sugar; how much of late increased; and of the particular Prices of Sugars for Nine Years past; and the Effect of Exportation. He was cross-examined, in relation to what Surplus imported in certain Years; and as to the Difference of the Price of Sugars in Hamburgh, Holland, and England. Next, Isaac Gunnarney was examined upon Oath, as to the Price of Sugar in the Year 1731; the Price of Sugar in Antigua; and the Difference of Pounds in what is called a Hundred Weight, in different Countries. Also Nathaniel Basnet was produced, sworn, and examined, in relation to the Price of Sugar in Antigua and other Places; the Difference of the Weight of what is styled an Hundred, in different Places; the Number of Ships sent from Liverpoole in the Sugar Trade; and how that Place might be affected. Likewise, Samuel Haswell examined upon Oath, as to the Prices of Sugar Abroad; and how much the French sell cheaper in the Plantations. And also, Abraham Le Sturgeon examined, in the same Manner, as to any, and what, Payment is made at Dunkirk, for Goods coming from The West Indies. Then Mr. Buchanan was again called, in order to give an Account of the Effect he conceived the carrying of Sugars would have to the Places intended, without being first landed here. Mr. Murray heard at large for the Bill; and, having done, offered to call Witnesses, to make it appear that, as the Law now stands, this Kingdom is not able to furnish Foreign Markets with Sugars; but, as altered by this Bill, we may be able to furnish them. Ordered, That the further Consideration of the said Bill be adjourned to Friday next; and the Second Reading of the Bill relating to the general Registering of Deeds, appointed for that Day, to Tuesday next; and the Judges then to attend. Ordered, That the House be put into a Committee on the Bill for building a Bridge cross the River Thames, on Monday next; and the Bill for improving the Navigation of the River Lee to be read a Second Time on that Day; and Counsel to be then heard as well for as against the same; and the Cause which stood for an Hearing on that Day be put off to the Wednesday following. Dominus Cancellarius declaravit præsens Parliamentum continuandum esse usque ad et in diem Jovis, tricesimum diem instantis Maii, hora undecima Auroræ, Dominis sic decernentibus. Epus. Landaven. Ds. Hardwicke, Cancellarius. To return the Bill, intituled, "An Act to obviate some Doubts which have arisen, upon the Construction of an Act made in the First Year of the Reign of King William and Queen Mary, intituled, "An Act for explaining Part of an Act made in the First Year of the Reign of King James the First, concerning Tanned Leather;" and for rendering more effectual a Clause in the said last-mentioned Act, which obliges Curriers to curry Leather;" and to acquaint this House, that they have agreed to their Lordships Amendments made thereto. and the E. of Inchiquin's Bill. 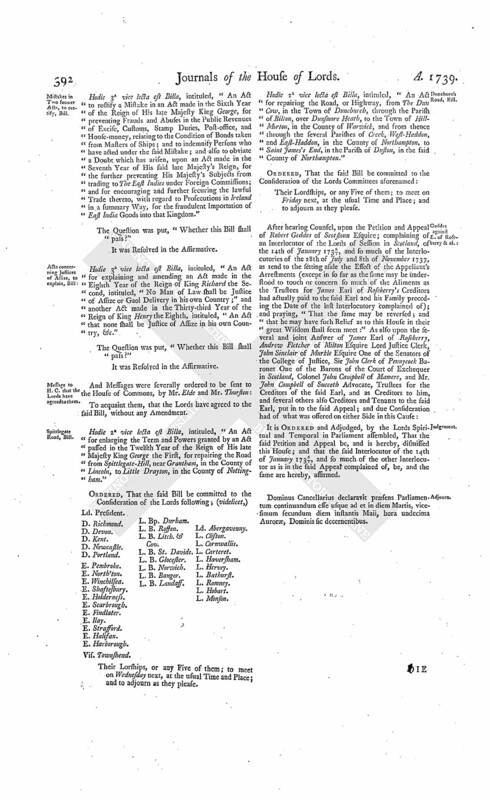 To return the Bill, intituled, "An Act for Sale of Part of the Estate of William Earl of Inchiquin, in the Kingdom of Ireland, for Payment of the Debts and Encumbrances charged thereupon; and for settling such Part thereof as shall remain unsold, according to his Marriage Agreement;" and to acquaint this House, that they have agreed to the same, with some Amendments, whereunto they desire their Lordships Concurrence. The said Amendments were read, and agreed to. And a Message was sent to the House of Commons, by Mr. Sawyer and Mr. Montague, to acquaint them therewith. Suitors in Chancery, Interest of Money, Bill. Hodie 3a vice lecta est Billa, intituled, "An Act to empower the High Court of Chancery to lay out, upon proper Securities, any Monies, not exceeding a Sum therein limited, out of the common and general Cash in the Bank of England, belonging to the Suitors of the said Court, for the Ease of the said Suitors, by applying the Interest arising therefrom for answering the Charges of the Office of the Accomptant General of the said Court." Hodie 3a vice lecta est Billa, intituled, "An Act for taking off the Duties upon Woollen and Bay Yarn imported from Ireland to England; and for the more effectual preventing the Exportation of Wool from Great Britain, and of Wool and Wool manufactured from Ireland, to Foreign Parts." To acquaint them, that the Lords have agreed to the Two last-mentioned Bills, without any Amendment. Clerk in the Parliament Office, Petition referred to Committee of Privileges. Upon reading the Petition of James Price; setting forth, "That he now is, and for upwards of Fourteen Years last past has been, employed as One of the Clerks in the Parliament-office; and on Friday the 11th Instant was served by one John Thomas, with a Copy of an Attachment of Privilege, at the Suit of Edward Haryes, One of the Attornies of the Court of Common Pleas at Westminster, by leaving the same with the Petitioner, then actually employed in the said Office; and praying the Consideration of the House; and that such Order may be made therein as to their Lordships in their great Wisdom shall seem meet:"
It is Ordered, That the said Petition be referred to the Lords Committees for Privileges; to meet on Monday next; and that the said Edward Haryes do then attend the said Committee. Hodie 2a vice lecta est Billa, intituled, "An Act for granting to His Majesty the Sum of Five Hundred Thousand Pounds, out of the Sinking Fund, for the Service of the Year One Thousand Seven Hundred and Thirty-nine; and for enabling His Majesty to raise the further Sum of Five Hundred Thousand Pounds, out of the growing Produce of the said Fund; and for the further appropriating the Supplies granted in this Session of Parliament; and for giving Time for the Payment of Duties omitted to be paid for the Indentures and Contracts of Clerks and Apprentices." Motion for Address, to know if Spain had paid the £. 95,000. Moved also, "That an humble Address be presented to His Majesty, That He will be graciously pleased to acquaint this House, Whether the Sum of Ninety-five Thousand Pounds, agreed by the late Convention to be due on the Part of Spain, as a Balance to the Crown and Subjects of Great Britain, and stipulated to be paid in Money, at London, within the Term of Four Months, to be reckoned from the Day of the Exchange of the Ratifications, has been paid in Pursuance of the said Treaty; and, if not paid, on what Pretences the same has been delayed or refused by the Court of Spain?" Ordered, That the last mentioned Bill be committed to a Committee of the whole House, on Monday next. Then the Question was stated, on the said Motion for an Address. The Duke of Newcastle acquainted the House, That he had His Majesty's Leave to inform their Lordships, that the Money so stipulated to be paid on the Part of Spain is not yet paid; nor has there been any Reasons assigned for the Non-payment thereof." The Question was put, "Whether such an Address shall be presented to His Majesty?" State of the Nation to be considered. Ordered, That, on Monday next, this House will take into Consideration the State of the Nation; and the Lords to be summoned. And that the Bill, for improving the Navigation of the River Lee, be read a Second Time on that Day; and Counsel as well for as against the same to be then heard. Dominus Cancellarius declaravit præsens Parliamentum continuandum esse usque ad et in diem Veneris, primum diem Junii jam prox. sequen. hora undecima Auroræ, Dominis sic decernentibus.